Flip Out Mama: Now To Get More Organized. disclosure: I was compensated through the Global Influence Network for my participation in this post. Well, now that Tater is back in school, I really need to start reading up on how to get organized. I really feel like there are just so many things going on throughout my days that I have to get done. There is getting up and getting Tater off to school, then housework, and blogging, trying to play with the Bean, yardwork, trying to squeeze in some quality time with Tater in the little window of time that we have, then for me it's off to work at 5pm, only to get home around midnight and be utterly exhausted again. Shew. No wonder I have a hard time getting anything done or remembering what I am supposed to do! I think I might have found something that is going to really help me with my organization goals this year. About One is a great site that I recently discovered that helps families stay organized and helps to keep all your important "stuff" in one place. About One includes a digital filing system and more! You can use About One to file away so many things! We are always overloaded with papers and information, it is so so hard to keep up with it all! About One includes things like family calenders, family newsletters, babysitter instructions, home maintenance records, not to mention health records and histories, vehicle maintenance, and more! It also has a built in address book, which I think is a great feature! Another really cool thing is that each family member has it's own page,which is kinda like a scrapbook. You can upload photos, schoolwork, etc, and add special memories and milestones for each family member! This site is such a cool idea! I think it's really great to have all of those resources and information all together in one place. I am very confident that using About One is going to help me become less frazzled! Now, I have a feeling that using About One will also help me with one of my most pressing questions: "How To Declutter??" To help you get organized too, About One is going to offer all of my readers a 17- day FREE TRIAL!! Go here to sign up for the free trial! It is really easy to sign up! "The 17 day Free Passport gives you 17 full days of usage with no expiration date (requires no credit card information). Use each of your 17 days whenever you like. 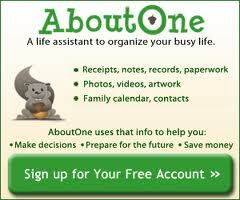 Our Yearly Plan gives you a full year of access to AboutOne for the low price of $30 per year." As if that wasn't enough, About One is offering a great giveaway too! Rules: One winner will be chosen at random from all entries across all blogs to receive the following prize: $500 AMEX gift card and an upgrade to a free subscription to AboutOne.com to 1 grand prize winner + a $250 donation to the school of their choice. All other entries will receive an email with a code for 25% off a one year subscription to AboutOne.com. This giveaway ends September 9th at 11:59 p.m. ET and is open to U.S. residents age 18 or older. To be eligible, you must be signed up for the free trial! You can do that here! This is such a great giveaway and such a great resource for moms! I invite all of you to sign up and try it for yourself! I'm so excited for you guys to get a chance to try it! I am going to go work on organizing myself! :) Let me know what you think of it when you try it!